Christmas is coming a little early this year at Overshores Brewery in East Haven. Like, December 12 early. Like, 12-4 early. At that time they’ll be kicking off their BelgXmas Holiday Bash that is absolutely free for anyone to attend. Ladies and gentlemen, children of all ages…welcome to the greatest…er…pub fest on Earth! Well, er…maybe just the ladies and gents, no children wanted here at Pub Fest, part of the 2013 Barnum Festival in Bridgeport. Started in 1949, the annual Barnum Festival has brought Bridgeport together with various events around the community. And, part of this year’s festivities just happens to be Pub Fest. When you buy your passport for just $20, you’ll get access to a “light” buffet (but, it’s a buffet aka pig out), discounted drinks (especially “Ringmaster Red), and free entrance to see Bill Genaurio and Destiny at the Bijou Theatre. Pub Fest 2013 goes down on 6/7 from 5:30-8 with the live music going on from 7-11 pm. Get your passport at any of the pubs/restaurants listed below or at Barnum Festival HQ at The Holiday Inn on 1070 Main Street in Bridgeport. Hey, Live Green Connecticut! Eco-friendly Festival Recycled Again in Norwalk. After just coming back from Seattle and Portland, we were amazed at all the amazing advances they have made in terms of keeping things green and keeping things real. Almost everywhere you went to eat you’d see bins to recycle and bins to compost. Yes, compost! Also, breweries give away their used up grains to local farms for the animals. One last amazing thing that we witnessed was awesome trash compactors set up all around the food carts. Turns out by compacting the food (btw, the utensils and packages are also compostable), garbage trucks barely need to do any pick ups. Pretty wild stuff. We’ve walked by The Fez several times since they opened this past summer uttering the words, “We have to try that place someday.” But it always seemed that when we had the chance, we’d say, “Hmm, not sure I’m in the mood for Moroccan food.” Now we know, that was a BIG mistake. With their large and eclectic menu of snacks, small plates, and entrees inspired by a variety of flavors across the Mediterranean, there is something absolutely fabulous for whatever mood you’re in. Upon entering we were immediately struck by the amazing smell of Mediterranean spices. One quick look to the left revealed the specials of the day on a little chalkboard. Walnut and currant glazed lamb chops with mushroom gnocchi caught my eye. Wow, I’d never seen such a unique combination. A glance over the left revealed a small bar, intimate little tables, colorful Moroccan decor, and a small stage area for their vast array of nightly entertainment. We knew right away we were in for a great experience. I know I’ve said this before, but we had an incredibly hard time choosing what to order, to the point where we were asking each other if we were hungry enough to eat six different dishes! We expressed our indecision to our first waitress, to which she offered up the owner and resident wine expert, Eric, to help us choose the perfect dishes and the perfect accompanying wine. Meeting Eric was a very nice experience–pleasant, passionate, and smart. He informed us that the wine list isn’t up-to-date because they can’t keep up with his thirst for discovering and purchasing new wines, especially from Lebanon and South Africa. Love it! We let him take the reins on recommending a bottle based on our taste. He popped open a California blend that I didn’t love. His response? “No problem, I want you to love the wine, and if you don’t we’ll keep trying options until you do.” The next bottle was ‘the one.’ A medium-bodied blend from Lebanon, the 2007 Reserve du Couvent by Chateau Ksara had forward fruit flavors and a slight spiciness. The perfect pairing to what we were about to enjoy. 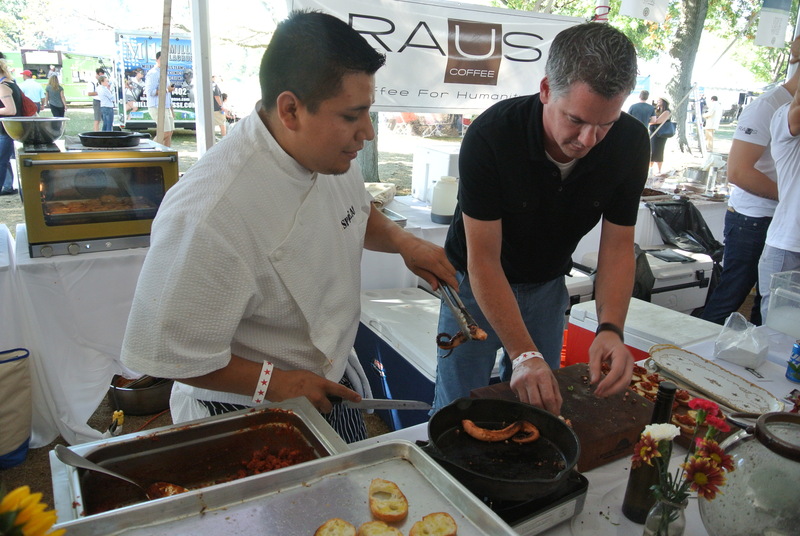 Danny and I started off by sharing two phenomenal dishes from the “snacks” section of the menu. The caramelized cauliflower with brown butter sauce, golden raisins, and pine nuts was a delicate and flavorful fusion of French and Moroccan flavors. I typically don’t like cauliflower, but this was perfecto! Then, we thoroughly enjoyed the Pizzet Aroub, where Italy meets the Middle East– a unique combination of soft and perfectly sweet braised onions, sumac, olive oil, and pine nuts. On to the main dishes. 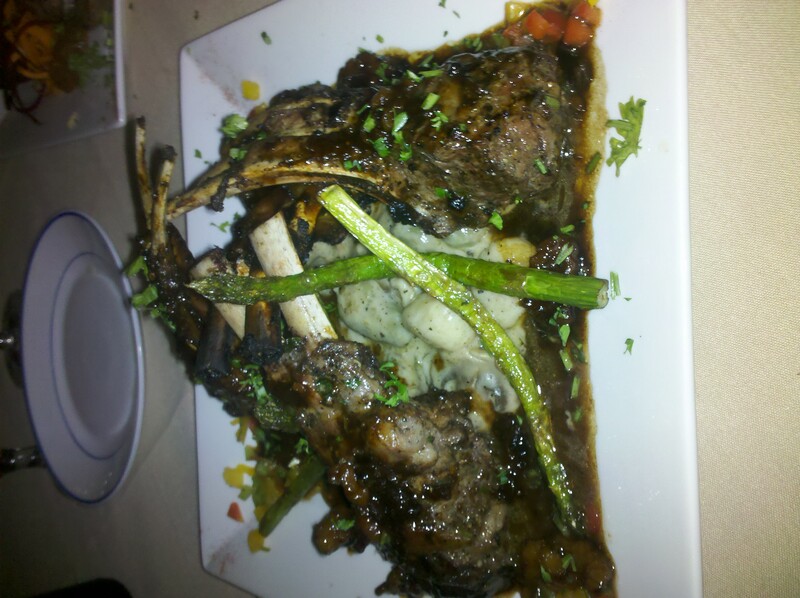 I HAD to order the special I mentioned earlier–walnut and currant glazed lamb chops with mushroom gnocchi. Words cannot explain how intensely delicious this dish was. Perfectly cooked lamb (just under medium), slightly sweet and oh-so savory currant sauce, glazed walnuts, and hand-made gnocchi from the Bronx with an earthy mushroom sauce was one of the most fantastic flavor combinations my taste buds have enjoyed in a long time. Danny ordered the grilled seven spice sirloin with tomato jam and fingerling potatoes. The sirloin was also fantastically seasoned and perfectly cooked at medium-rare, and the flavorful, but not overpowering, tomato jam was the perfect complement. We then ended with Moroccan coffee, spiced with cinnamon, ginger, and cardamom and the Briwats for dessert, which is basically an Israeli baklava but not as teeth-hurtingly sweet. It was quite delicious! After sharing our enjoyment with our very friendly and knowledgable second waiter, Thami (who happens to actually be from Morocco), he informed us that before they even opened they had a French chef from a 4-star hotel in Dubai and a Moroccan chef working together to craft and test this perfect menu… and perfect it was. And, to finish off this divine trinity was the entertainment. 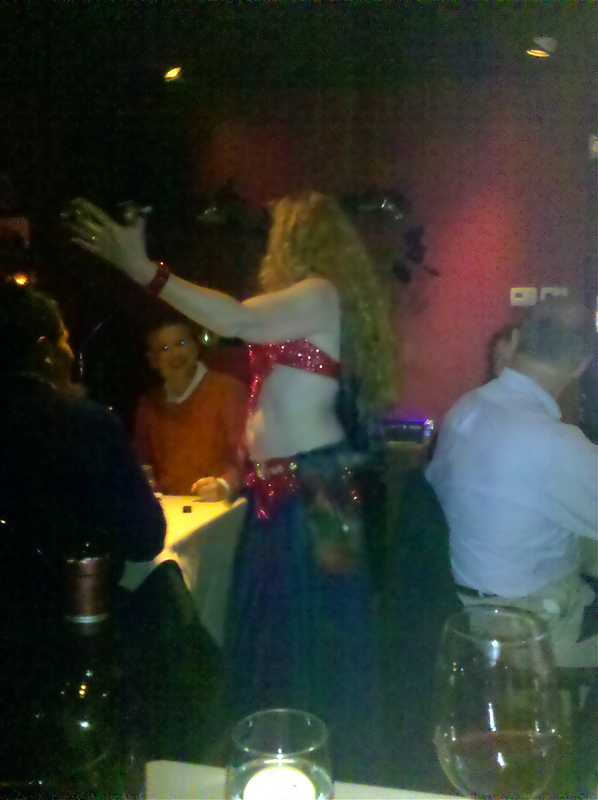 We we were lucky enough to be there on a Friday night, which is belly dancing night (as is Thursday). Around 9:00 the beautiful Moroccan music suddenly became louder, then a roar from the diners as the beautiful and smiling Adina danced her way around the tables. I was impressed by her skill level. And she didn’t just dance up there on the stage for the world to adore her. She also came out to the tables and had a great time dancing with a few willing diners. In fact, when she saw me dancing in my seat a little (I can’t help myself), she came over and wisked me up on stage to dance with her. Of course, after eating all that food, I thought I was going to die, but it was a blast. By the time we left we discovered that we’d been there for 2.5 hours! The time just flew by, and despite the line of people hoping to get in, they never once rushed us to leave. Reservations are not just recommended, they are pretty much required on the weekend if you don’t want a long wait. And be sure to check them out on the weekdays too since there’s entertainment every night, including jazz bands, turntables, and singer/songwriter night (last week they had one of Paul Simon’s guitarists playing). So no more “not in the mood for Moroccan” excuses, The Fez is a MUST-DO for everyone!